High resolution and perfectly sized: 1.5" x 0.5"
Applied Labels™ are our flagship and most popular product. They're perfect for labeling everything from bottles, sippies and shoes to school supplies, gadgets, summer camp gear and all those little things that go to early childcare centers. Available with and without icons or with a second line of custom print. Great for grown-ups too! Applied Labels™ can also be used with clothing with tags and shoes. Apply them to a dry and clean surface. Handle the label by the edges to avoid contaminating the adhesive. Place the label and press very firmly, especially on the corners. Wait 24 hours before washing as bond strength builds with time. Applied Labels are great for coats, sweaters and uniforms with tags. They are not for use on underwear, socks or tagless T-shirts. *i.e., phone number or email. The layout of your label will vary based on your font, icon and text selections. 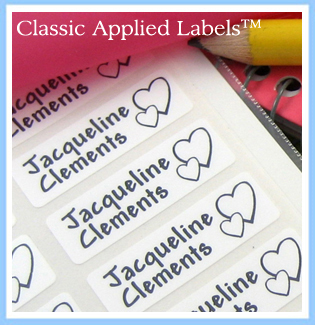 Applied Labels™ are ultra-tough personalized name labels. Our labels have twice the adhesive strength of most labels. The labels are waterproof and dishwasher-safe. They are also laundry-safe when applied to the tag with our clothing backers. They are the perfect labels for kids attending daycare, school, or camp. The are equally great for grown-ups or nursing homes too. Your labels will stay put and so will the ink, 100% guaranteed.